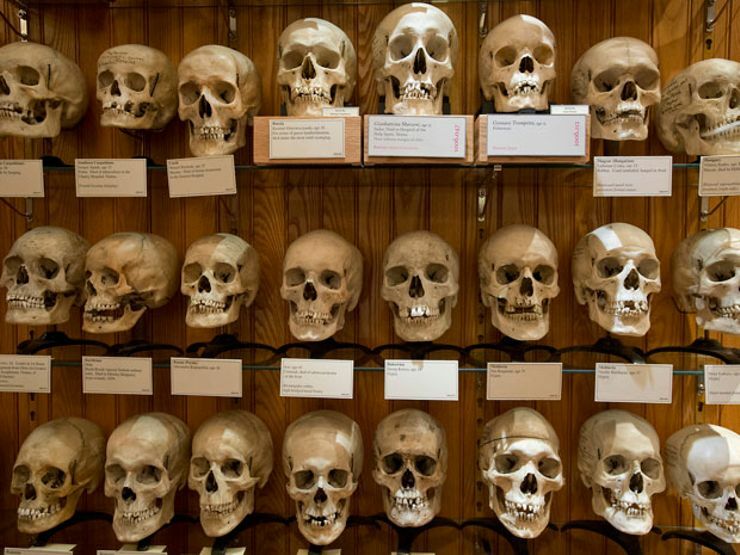 The next time you find yourself in Philadelphia, you may want to consider paying a visit to the infamous Mütter Museum. 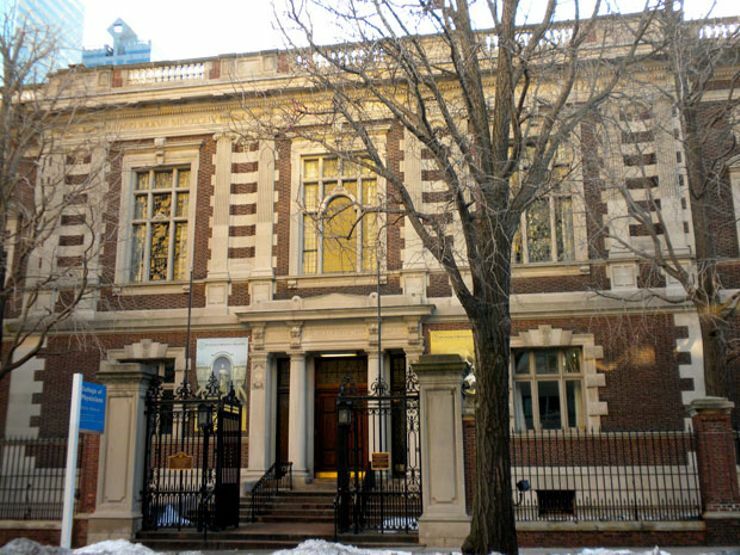 It was founded in 1863, after Dr. Thomas Dent Mütter donated his collection of medical anomalies, wax models, diseased specimens, and medical equipment to The College of Physicians of Philadelphia. Today, the museum boasts a collection of over 20,000 specimens, with about 15 percent on view to the public. Believe us, that small percentage is plenty for nightmares to last a lifetime. Though it was originally intended for biomedical research, the Mütter Museum is a funhouse for those with a morbid sense of curiosity. Here are some of the creepiest things you can see on display there. But be sure to skip lunch before your visit, lest you want to lose your meal. Want more creepy museums? Sign up for The Lineup's newsletter and receive our eeriest places delivered straight to your inbox. You’ll find several anthropodermic books, or books bound in human skin, at the Mütter Museum. The museum’s neighbor, the Historical and Medical Library, holds the largest collection of anthropodermic books in the world. There you can see three books bound in the skin of a woman named Mary Lynch, who died from trichinosis (a parasite that comes from pigs). During her autopsy, a large portion of skin from Mary’s thigh was saved, and three medical books about childbirth were bound with it. 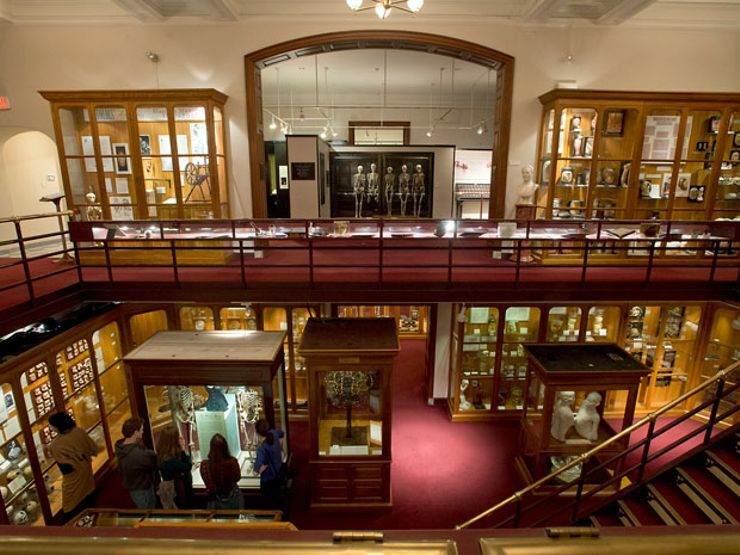 One of the largest collections at the Mütter Museum is what they call “wet specimens,” parts of the human anatomy preserved in jars of formaldehyde. Because of their fragile nature, the 1,300 jars representing every part of the human anatomy are kept in constant rotation. One particularly disturbing specimen is a baby born without a skull: a fetus that could not sustain life outside the womb. Mütter’s Hyrtl Skull Collection is made up of 139 human skulls which belonged to Viennese anatomist Joseph Hyrtl, whose life work was the study of the Caucasian population of Europe. Hyrtl wanted to show variation in cranial anatomy as an argument against essentialist theories about race. Each skull is mounted on the wall, and many are inscribed with Hyrtl’s notes about the person’s age, place of origin, and cause of death. Chang and Eng Bunker were Thai-American conjoined twins who were born in 1811 and died in 1874. They were joined at the sternum and shared a liver. Other than that, however, they were two fully-grown, independent men. The two made a life for themselves in North Carolina, and even got married to a pair of sisters. Chang had 11 children, and Eng 10. The fused liver that the two shared is now on display at the Mütter museum, as is a death cast of their torso. In addition to Chang and Eng’s liver, the Mütter Museum also owns a large collection of conjoined fetal specimens, including a two-headed baby, as part of their wet specimens collection. Known as “Jim and Joe,” this two-headed baby, in a jar full of formaldehyde rests in the Gretchen Worden room, named after the Mütter Museum’s beloved curator who died in 2004. History buffs will love the specimen of the spineless (get it?) man who assassinated Abraham Lincoln. Shortly after Booth was killed during a shootout with the police, his body was sent to Washington, where it was autopsied. The three vertebrae (3rd, 4th, and 5th) were removed to allow access to the bullet, and sent to the College of Medicine in Washington, D.C. Some of that vertebrae and a piece of his thorax ended up on display at the Mütter Museum. 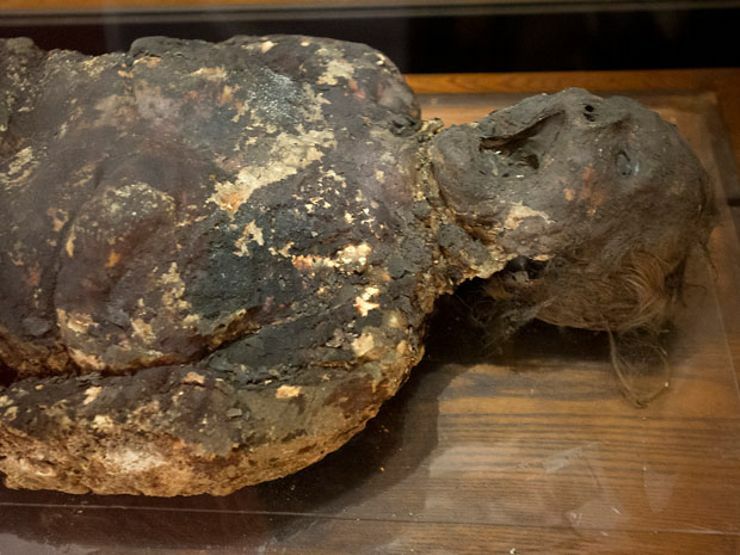 Exhumed in 1875, the Mütter Museum’s Soap Lady gets her name from the waxy, soap-like condition of her remains. Corpses high in body fat are prone to this rare chemical condition, which preserves the body in a waxy coating of broken down fat called adipocere. Scientists at the Mütter Museum believe the Soap Lady died sometime in the 1800s. Her corpse was exhumed from a local cemetery to make way for construction, and Joseph Leidy, a professor of anatomy at the University of Philadelphia, jumped at the chance to study the unusual phenomenon. Another highlight of the wet specimens collection is a large tumor that was extracted from President Grover Cleveland’s jaw in 1893. With the country in financial turmoil, Cleveland didn’t want to upset the American populace even more, so he had the surgery on a boat and said he’d had a tooth extracted. Luckily the tumor was benign, but it left Cleveland with a significant disfigurement. Harry Eastlack, born in 1933, suffered from an extremely rare condition known as fibrodysplasia ossificans progressiva, or FOP, in which the repair mechanism in the bones of the body works in overdrive, turning muscle and other tissue into bone. By the time Eastlack died in 1973, just short of his 40th birthday, his entire body had ossified, and he could barely move his lips to speak. His unusual skeleton is on display at the Mütter museum. If you feel you’re being watched while you tour the Mütter Museum, this display might explain why. On the lower floor of the museum, you’ll find 40 eyeballs on what is known as the eye wall. Though they are wax replicas, these eyes are plenty terrifying, featuring real-life horrific medical conditions, like cancer of the eye, pinkeye, cysts, and gangrene. Fun! If the eye wall and the baby without a skull weren’t enough to put you off your lunch, one of the highlights of the wet specimens is a soccer ball-sized cancerous ovary. Creepy enough to motivate you to book that yearly physical? Yeah, we thought so.